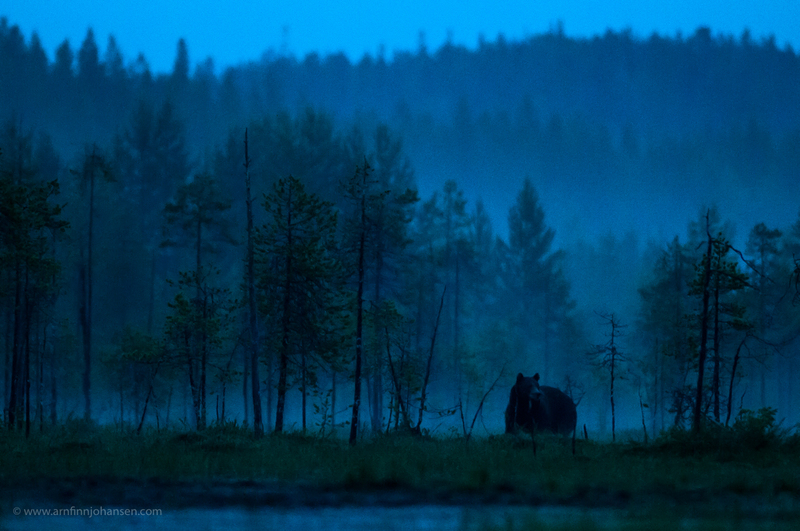 This summer I will have a photo exhibition at Kittilbu Museum (Randsfjordmuseene) in Vestre Gausdal near Lillehammer. The exhibition opens June 26 at 12:00 and will remain open until September 18. The exhibition presents photographs of brown bears I have taken in Finland, and it will be possible to purchase prints and framed photographs at the museum. The background for this photo exhibition is the “Deisjø Bear” that unfortunately was killed in Gausdal in 2008 at the age of 18 years. Being radio collared and followed by scientists for many years this bear is one of Norway’s most “famous” and well-documented bears. Now the “Deisjø Bear” has been stuffed and its new “home” will be Kittilbu Museum, where it can be seen for the first time on the exhibition’s opening day on June 26. In this context the museum also present information about the brown bears in general, their habitat, food, cubs, track marks, hibernation, life span, etc. On the opening day there will also be lectures. Brown bear in the night. Nikon D300, Nikkor 400/2.8 at f/2.8 and 1/100 sec. ISO 6,400. Jeg har jo sett bildene på \”gutterommet\” før du hang dem opp og kan garantere høy kvalitet !! Kittelsbu anbefales !! !